Apparitions are unusual. And, yet, they are dramatic reminders of what is going on all the time. 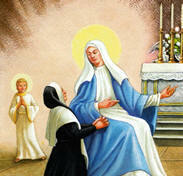 About midnight on July 18, 1830, Catherine Labouré (a novice with the Daughters of Charity of St. Vincent de Paul) was led to the chapel of the Rue du Bac in Paris and there spoke with the Mother of God. In a dramatic way, she experienced the care and affection which Our Lady has for everyone but, especially, for those who bear the Name of Her Son and call themselves Christians. 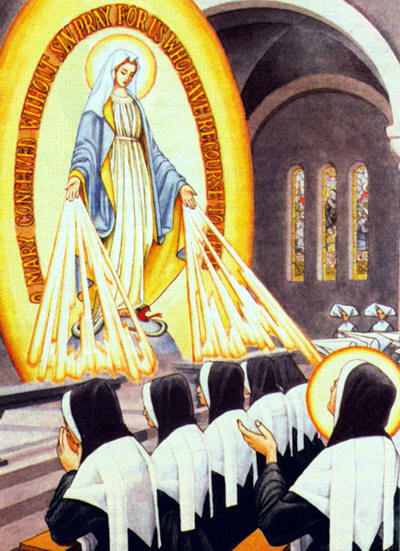 The Mother of God gave Catherine a mission and She revealed to Catherine the trials that she would undergo in its performance. On November 27, the Mother of God showed Catherine the design of a Medal that would remind the world of Her love and protection. Mary assured Catherine that she would receive all the strength and consolation necessary to bring this mission to a successful completion. Our Lady promised that all those who wear the Medal will not see eternal damnation. For 46 years, Catherine lived an ordinary, obscure and laborious life as a Daughter of Charity and no one, except her confessor, knew that it was she who had received from Our Lady the request to have the Medal made and distributed. In their various apostolates, the Daughters of Charity and the Vincentian Fathers have since then publicized and promoted the Medal and its message to the world. On the back of the Medal, we see a large letter “M” with a Cross above it. “M” is for Mary and Mother because She is indeed the Mother of God’s people, a people founded on the twelve Apostles, signified by the 12 stars arranged around the side. God’s people have learned to turn to their Mother, knowing She will listen with a mother’s sympathy and affection. The two Hearts are those of Jesus and Mary. God’s message for Mary was one of suffering: ‘a sword will pierce your heart too’ just as the Heart of Her Son would be pierced by a soldier’s lance. The picture of the two Hearts is a reminder of God’s love for us: Mother and Son united in the work of Redemption. Christ offers Himself on the Cross and Mary stands by that Cross assenting in Faith so that the world might be saved. The Medal, then, is a summary in itself of the Church’s teaching on Our Lady, as well as a personal message to each one of us: MARY IS OUR MOTHER, MEDIATRIX and CO-REDEMPTRIX. “Her feet rested on a white globe … I saw rings on Her fingers; each ring was set with gems, the larger gems emitted greater rays and the smaller gems, smaller rays. I could not express what I saw, the beauty and the brilliance of the dazzling rays; a frame formed round the Blessed Virgin. 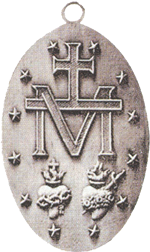 Within it were written in letters of gold, “O Mary, conceived without sin, pray for us who have recourse to thee.” At this instant, the tableau seemed to turn and I beheld the reverse of the Medal: a large “M” surmounted by a bar and a Cross: beneath the “M” were the Hearts of Jesus and Mary, the one crowned with thorns, the other with a pierced sword. When Saint Catherine related the vision to her confessor, Vincentian Father Jean-Marie Aladel, he asked her whether she had seen any writing on the back of the Medal. She answered that she had seen none at all. In 1832, the first Medals were made in accordance to Our Lady’s design. They were freely circulated and, in a short time, were worn by millions. 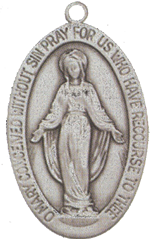 Innumerable wonders followed: health was restored, bad habits broken, dangers averted until the little Medal of the Immaculate Conception soon became known by the name it bears today, the Miraculous Medal. Interestingly, it was not until the year of her death in 1876, St. Catherine revealed that she had received the Medal from Mary. She had kept the secret for 46 years. all those for whom we pray and all those with whom we are united in prayer. 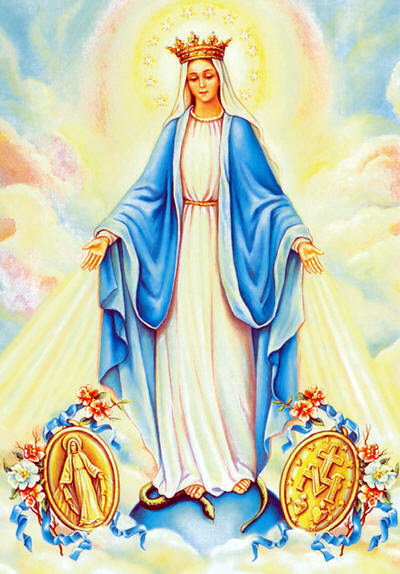 O Immaculate Virgin Mary, Mother of Our Lord Jesus Christ and Our Mother, penetrated with the most lively confidence in thy aIl-powerful and never failing intercession, manifested so often through the Miraculous Medal, we thy loving and trustful children implore thee to obtain for us the graces and favors we ask during this Novena, if they be beneficial to our immortal souls and the souls for whom we pray. (Pause) Obtain for us, O Immaculate Virgin Mary, a deep hatred of sin, and that purity of heart which will attach us to God alone so that our every thought, word and deed may tend to His greater glory. Obtain for us also a spirit of prayer and self-denial so that we may recover by penance what we have lost by sin; and, at length, attain to that blessed abode where thou art the Queen of Angels and of men. Amen. This entry was posted on Wednesday, February 15th, 2012 at 9:07 pm and is filed under Catholic Rosary, NewsFlash, Saint Philomena. You can follow any responses to this entry through the RSS 2.0 feed. Both comments and pings are currently closed.